See its French thats why its not called chocolate. See now your confused. 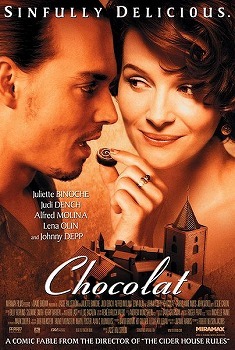 Chocolat tells the story of a young mother, played by Juliette Binoche, who arrives at the fictional, repressed French village of Lansquenet-sous-Tannes with her six-year-old daughter and opens La Chocolaterie Maya, a small chocolaterie. Her chocolate quickly begins to change the lives of the townspeople. This is a verr pleasing and light-hearted film. At points comedy ensues and it is very obvious when it does but at some points the drama is really heavy that is there too. Juliette Binoche gives a great and lovely performance as the young mother who despite being knocked down so many times still gets back up. Judi Dench who plays the woman who gives her the shop is very effective and free-spirited and she does very well too. The only problem I had was that Johnny Depp was on the bill card but he was not a huge character in this film, and he is basically only used to become the love interest for Bincohe. The tension is something that you can feel between the town and Binoche, and it never really loses effect. Alfred Molina who plays the governer is a very believable character who I think should’ve gotten a best supporting nom. at the oscars. The one problem I did have with this film that at times the film thought the only way the town could be happy was through eating chocolate[ or i should say chocolat}. And this seems very unbelieveable because the townspeople never change their ways just their eating habits. Still it is a very joyful and light-hearted fable that should be watched by all.